With DOC xPress, snapshots of the environment can be captured with just a few clicks, making it easy to capture what an environment looks like before making changes. At its core, DOC xPress operates on metadata snapshots that are stored in a shared team database. 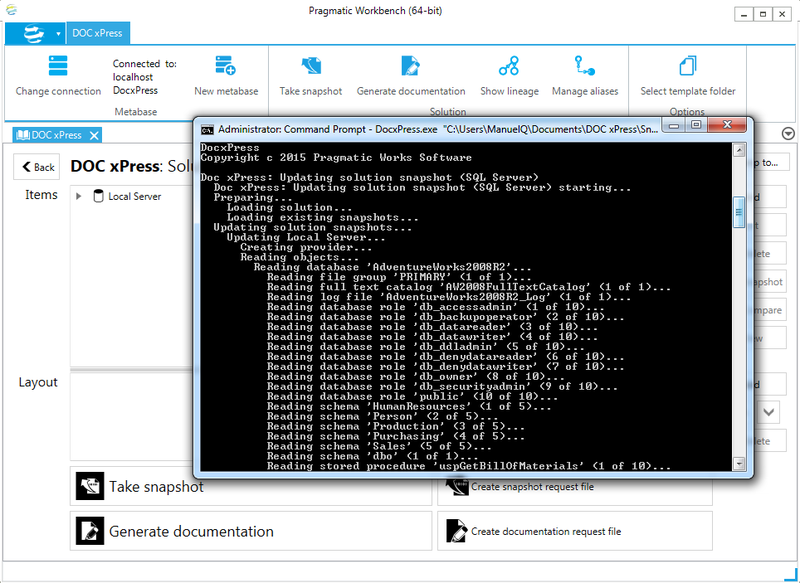 The Snapshot Process takes a solution configuration and reads all sources, updating the stored snapshot and maintaining a version history chain. This snapshot includes all supported providers, including SQL Server, Integration Services and Analysis Services. This feature of DOC xPress enables users to determine the differences in a single environment over time, or between different environments. Having the ability to compare snapshots can aid both developers and DBAs who are trying to track down the source of either consistency or performance problems. There may be times when creating a snapshot needs to be automated, often as part of another process. The Snapshot Command Line will provide the ability to create a snapshot from the command line, or any tool that can run an executable file. 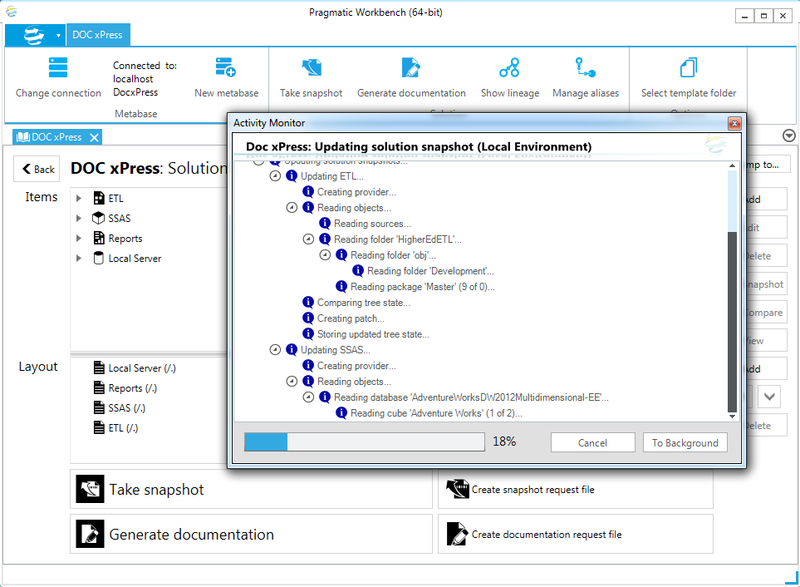 After defining the objects to document using DOC xPress, information is gathered and stored in a snapshot. Multiple snapshots can be taken of the same group of objects so they can be compared over time, or have documentation generated for a point in time. 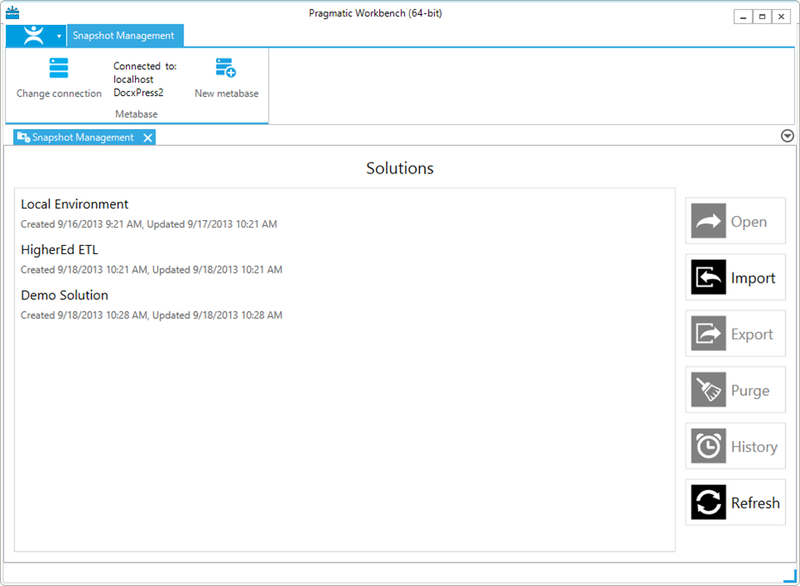 DOC xPress has a Snapshot Management feature that allows you to import and export entire solutions or individual items. In addition, you can choose to export only the most recent snapshots, all snapshots after a particular point in time, or the entire history of the selected item.